We’d love your help. Let us know what’s wrong with this preview of The Map by William Ritter. To ask other readers questions about The Map, please sign up. “There is no golden light, Mr. Jackaby. Not for normal people.” Jackaby’s gift as a seer allows him to penetrate magical concealments, make impossible connections, and recognize the auras surrounding objects and people, particularly those with magical significance. I have the rather less unique ability to see the world the way it actually appears. “Only in present company,” I teased back. Aah, I have missed you “There is no golden light, Mr. Jackaby. Not for normal people.” Jackaby’s gift as a seer allows him to penetrate magical concealments, make impossible connections, and recognize the auras surrounding objects and people, particularly those with magical significance. I have the rather less unique ability to see the world the way it actually appears. A fun and lovely short story/novella for the series (somehow I missed it being released ).. this is the Jackaby I loved and missed from book two. The market was very interesting as well. I did not think I was going to like this book but I see I was wrong. I actually loved it. It was weird but also very funny. I would read the 4 books that go with this book. Jackaby and Abigail set off on another (smaller) adventure. It is Abigail's birthday and Jackaby takes her to a mystical market where the two find a map and decide to follow it to the very end. The pair must decipher the map and follow it to the X. This story is very cute. It's a fast and quick read. Any fan of the series so far will absolutely love this short story. I suppose since it doesn't spoil anything major from the first book you can definitely read this one before you read Jackaby, the first book in the series. If you want to try it out before you buy the book series definitely do so. The plot was absolutely great and I highly recommend the short story to everyone who has read the series. I am in love with Mr. William Ritter. He is so good at making me laugh. He writes with out hurry. With a wonder and a laugh. The best way to write. I absolutely love Jackaby. He is sweet and completely clueless to others emotions. I think Abigail and Jackaby are the right sort of team. I wonderful ying to his yang. In this delightful novella Abigail has turned another year older. Jackaby the ever entertaining employer and friend decided to celebrate Abigail's birthday with an adventure. He takes I am in love with Mr. William Ritter. He is so good at making me laugh. He writes with out hurry. With a wonder and a laugh. The best way to write. In this delightful novella Abigail has turned another year older. Jackaby the ever entertaining employer and friend decided to celebrate Abigail's birthday with an adventure. He takes her to a magical market. Along the way Miss Rook discovers an old treasure map that brings sweet memories of her childhood. 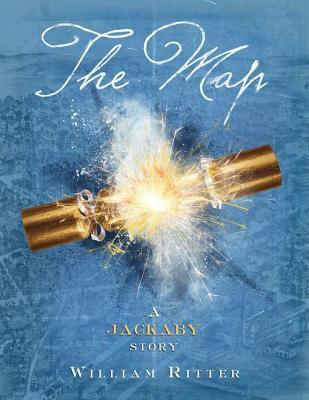 What Miss Rook doesn't know is that Jackaby secretly bought that treasure map for her birthday and they are about to go on a great adventure. Oh my word, this story! GAH. *huggles it* Okay, so it's a short story/novella type thing, which is free on Kindle, set between Jackaby and Beastly Bones. It's a short, fun read, and has an even different feel than the other two, but I simply LOVED it. It's Abigail's birthday, and Jackaby takes her on a treasure hunt with an old map and fantastical things ensue. But get this: it's entirely based around trying to find the treasure from the Irish song "Whiskey in the Jar." This kind of totally made Oh my word, this story! GAH. *huggles it* Okay, so it's a short story/novella type thing, which is free on Kindle, set between Jackaby and Beastly Bones. It's a short, fun read, and has an even different feel than the other two, but I simply LOVED it. It's Abigail's birthday, and Jackaby takes her on a treasure hunt with an old map and fantastical things ensue. But get this: it's entirely based around trying to find the treasure from the Irish song "Whiskey in the Jar." This kind of totally made my day!!! Just... the idea of it. I suppose for anyone who reads it who's not familiar with the song, they'd just be like "whaaat?" but since I grew up on old Irish songs and always loved that one, it was simply fabulous. I hardly have anything to say on this one because I don't want to ruin any of the plot, but it was just a rollick and I loved it. It had its share of perils and such, but mostly it was just an excuse for Jackaby and Abigail to go on an adventure together and interact, which was just so much FUN! I think sometimes, some of my favorite character pairings/groups could just do NOTHING plot-wise and I'd still enjoy it. In a way, big scary mysteries/adventures/problems which constitute "plot" can even take away from the fun of simple character interaction which is my favorite part of some things. “Obviously,” he replied without turning around. It wasn’t that Jackaby was rude, exactly. Tactless though he was, there was an earnestness to the man. “I should expect you to have long outgrown being impressed by the fact that the sun rises daily in the east, Miss Rook. Really. You can manage more impressive observations than that.” Then again, Jackaby might have just been rude. Marry me, pretty pretty please. P.s. My birthday is on September 3 "Morning, sir." Give me a treasure hunt and I will love you forever. William Ritter kind of did, so... Yes, I love his series! In this little short story, Jackaby takes Abigail on an adventure to find the Bold Deceiver's treasure and celebrate holiday! I will say that I was under the impression it lacked the realness of the 1st book, since in this novella there aren't just paranormal creatures but pure magic and gravitating islands and teleporting from one place to another using party crackers. But it was hilarious and entertaining and I'm startint to get all the #Roockaby feels! Loved this little novella even better than its predecessor, Jackaby. Brings to mind the wonder and wit of some of the best sci-fi I've ever read or watched. I'm not exaggerating when I say that William Ritter would probably write fantastic episodes of "Doctor Who." This is excellent stuff. In this short story it's Abigail's Birthday and Jacaby has plans for her. She wants adventure so they set off on one. All in all a fun quick read. I enjoy Jackaby's character so much as well as Abigail Rook. Quick, humorous and whimsical. Lovely!! I could not have asked for a more brilliant novella. Finally, a short story that actually adds to the series and enhances the character development. It made me adore Jackaby far more than I originally did and it answered some of my question about his supernatural gifts. I honestly loved it more than I can say. If you a fan of the series, don't overlook it. It's most definitely worth a read. Such a fun filler between Jackaby and Beastly Bones, a wonderful reminder of why I had enjoyed the first book so much. I just loved the references to Whiskey In The Jar and couldn't stop humming or singing it as I read. The story was short, but not too short. Of course, I wish it had been another hundred or so pages longer, but I will get more from these characters soon enough. Rook and Jackaby make a great pair and I am so anxious for more! It was fun but it feels as if the world inside of this short story is not the same as the world we got to know in Jackaby. In Jackaby, Jackaby makes it clear that he is a man of science but the mode of transportation that they use in this short story reeks of magic. I wished it would have been explained a bit more like a science thing or maybe something from a creature because now, it kinda feels like it doesn't fit with the story we got in Jackaby. Other than that it was fun though. This was a short fun adventure back in the world with Jackaby and Miss Rook. Clearly made want to pick up the next in the series. Ahhhh! How lovely to spend more time with Abigail Rook and Jackaby! "The air is anathematic, laden with an aura of untold danger." "Untold danger. Charming. That seems to be the unifying theme of today's outing." Fun, short story in which Jackaby has a special birthday treat for Abigail: a treasure hunt to hidden lands, full of riddles and the aforementioned untold dangers during which they travel by pulling on party crackers (which, by the way, I still find ingenious!). It doesn't really add much to the first book in my opinion, but it does strengthen the fun "p "The air is anathematic, laden with an aura of untold danger." "Untold danger. Charming. That seems to be the unifying theme of today's outing." Actually 3.5 stars. I sure do like Jackaby, and this novella was definitely a good fix for that. It's a good mini adventure to get me ready for when Beastly Bones comes out!! This was such a cute little story. I want to read Beastly Bones so bad, but this was almost enough to tide me over for another couple of days. I love Jackaby and Abigal Rook, that is all. Cute addition to the Jackaby series. Love that it was quite a bit more fantastical than the full novels. Oh, Abigail, how you don’t know him. This was just a fun, funny, adventurous short story where Jackaby decides to take Abigail Rook on a trip just to celebrate her birthday. As you can imagine, things don’t go well, they get into trouble, they make things worse, only to make things better, and they survive… barely. I really miss Doctor Who right now. I wish every novella was like this: free, longer than 5 pages, not necessary for the main novels but still a fun story in itself. The Map gloriously checked off all these points. It's a super cool treasure hunt that let me spend more time with the characters and that offered some creative extra world building. Fun short story set in the Jackaby/Rook storyline. It takes about 45 minutes to read. I enjoyed the treasure hunt. It reminded me of a cross between Doctor Who, the Hobbit and Monty Python. Great fun.